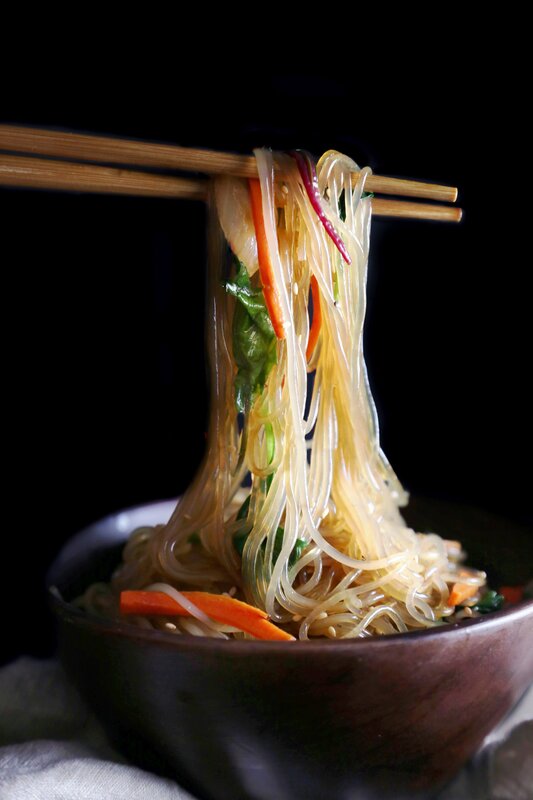 Korean-style sweet potato “glass” noodles stir-fried with a blend of vegetables. Vegan/vegetarian friendly and can be free of gluten, soy, and grain, depending on the soy sauce you use. We’re not the typical homeschoolers where school is done before lunch. Oh, how I envy those people. No, ours is a full day. I feel like I’m having to learn a lot of this stuff all over again. Gone are the days of one plus one equals two. With our days about to get busy again, I need simple and quick meals. Especially if I’ve been testing recipes for the blog all day. People usually think that being a food blogger means you always have fancy meals for breakfast, lunch, and dinner, but that couldn’t be further from the truth. Most of the time I make quick meals, like baked fish, stuffed potatoes, or pasta. Any type of noodle dishes are always a winner with my carb-loving family. Soy Sauce contains wheat, gluten, and soy. It’s fine to use if you have no sensitivities to foods. I suggest using the one with reduced sodium. Tamari is free of wheat and gluten. Coconut Aminos is similar to soy sauce, but made of coconut sap and is free of soy, wheat, and gluten. The great thing about this stir-fry is that you can use whatever veggies you already have on hand. It makes a great side dish or a vegetarian/vegan main dish, but feel free to add shrimp, beef, chicken, or any other protein of choice to make this a complete meal. Korean-style sweet potato noodles stir-fried with vegetables. Gluten and dairy free, and AIP friendly. Vegan/vegetarian friendly, but feel free to add your choice of protein, like shrimp, chicken or beef strips to make this a complete meal. In a small bowl, stir together tamari/soy sauce, honey/sugar, and sesame oil. Set aside. Place a large pot of water on the stove and bring it to a boil. When water is boiling, place the sweet potato starch noodles into the water and press down with a wooden spoon, until all the noodles are submerged in the water. Cook the noodles for 6 or 7 minutes, until al dente, drain and rinse under cold water. Place drained noodles back into the pot and cut a few times with clean kitchen scissors to make them a little shorter and easier to eat. Drizzle with a few spoonfuls of the tamari mixture and mix together thoroughly to keep noodles from sticking together. Drizzle cooking oil into a large pan or wok and place it on the stove over medium-high heat. Add onion and carrot into the pan and sauté for 2-3 minutes. Stir in mushrooms, half of the chopped green onion, garlic, and spinach/greens. Sprinkle with salt and cook for a few minutes until veggies are crisp tender. Add noodles to the pan, along with the rest of the sauce, some black pepper and toss together over medium-high heat for a few minutes until the noodles are warmed, about 2-3 minutes. Add salt to taste. Sprinkle with sesame seeds and top with the rest of the chopped green onion. Serve warm or at room temperature. What a deliciously unique school lunch idea! i love that you made this recipe really allergen friendly and healthy. Japchae is one of my favorite Korean dishes to order at a restaurant! Thank you, Cassie! This one is family-approved. The kiddos ate it all up. I’m glad you found this recipe helpful. Have a wonderful weekend! Such gorgeous shots of this amazing dish. Now I am hungry! This looks delicious!!! I absolutely love your photos, too — they’re stunning! This stir fry with sweet potato looks so good! I will have to give this recipe a try soon, thank you for sharing!